Pat Ferris edged out George Gamble by a half a wheel in Sunday’s Baldonnel Roubaix. Both had a time of 52:31 for the 23 km early season road race. 2010 series winner Gary Hilderman was third at 56:17. Kevin Shaw was not far behind despite a late start to get 4th at 58:25. Adam Currie was 5th at 1:03:41. This is Pat Ferris’s 6th win on the Baldonnel Roubaix loop, over the past 16 years. Thanks to Sandy McDonald for timing! 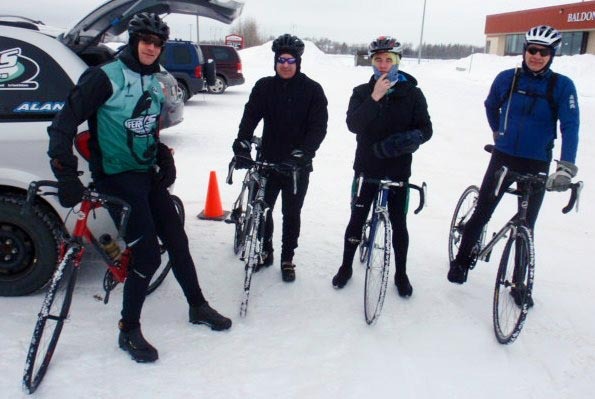 Conditions weren’t bad for this difficult winter race series. The temperature was -10 C with a chilly overcast and the roads recently snow ploughed. The gravel road portion was covered with packed snow and the pavement mostly dry. It was a lot colder as compared to last year’s sunny, warm and dry conditions. Two more races to go in the series. Next Sunday is the Montney Roubaix followed by the following Sunday’s Two Rivers Roubaix. Race time is 2 pm and the weather gods willing.